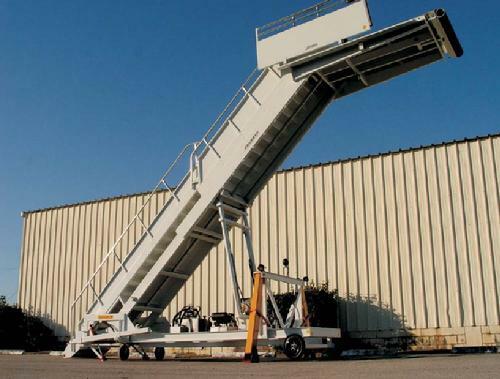 The Phoenix model PAS200 T stair is a towable version of our PAS200 truck mounted passenger stair. The PAS200 T will service commercial and military aircraft with door sill heights between 96� and 208� inches. The model PAS200 T is a two section stair with an �A� frame and four corner stabilizers. The chassis incorporates 4.00 x 8.0� solid tires at the aircraft end and 12� swivel casters at the rear. The chassis and stair sections are constructed with heavy structural steel members and non-corrosive aluminum stair treads and handrails. Lighting for the platform, each step and ground area is standard. Bumpers at the aircraft end are also standard. Power for raising and lowering the unit is accomplished with a gasoline engine driven hydraulic system. The direction control valves are mechanical and are easily accessible. An emergency hand pump to retract the stabilizers and lower the stair is a standard feature. The engine includes an electric start feature and an auxiliary alternator for charging the battery and powering the stair lights. There is a fixed tow bar for moving the unit short distances with a tractor. The tow bar is retractable for stowage out of the operation area.